Imagine if all of Asheville looked like Patton Avenue: six lanes packed with fast-driving cars, sporadic sidewalks, and zero bike lanes. Imagine if no one spoke out against aggression towards cyclists. Imagine if there were no Pumpkin Peddler, Bike Love, or youth bicycle program. That’s what our city might be like without Asheville on Bikes. But thanks to amazing support over the years from bicycle lovers like you, AoB has become the city’s most influential advocate for improving our transportation infrastructure, and we make a greater impact every year. Still, we’ve got a ton of work to do, and we need your help—and giving to Asheville on Bikes right now can go twice as far to help us continue making Asheville a safer, happier city to ride. Two generous donors have each pitched in $5,000, with this challenge to our community: match this donation with another $10,000 before the end of the year. Make a donation now. It’s easy, takes only a few minutes, and instantly helps AoB get closer to meeting our $10,000 goal. Give to AoB on #GivingTuesday, November 28th, as part of the global initiative to celebrate and encourage giving. Come to Button Up for Bikes on December 6th. Button Up for Bikes is our annual fundraiser, featuring local food and beer, a live auction, and lots of fun. Last year we raised over $20,000, so let’s show our 2016 selves who’s boss and break a new record! This year’s event will be held at the Wedge at Foundation’s Cloud room. Get more details and purchase tickets here. Any donation made between now and December 31 will be counted towards the challenge, and any amount you can give is worth it—in fact, if each current AoB member gave just $20, we’d have this challenge wrapped up already. As they say, many hands make light work. Educating City Council candidates. Hosted two City Council candidate forums to discuss local transportation issues and allow the candidates to see the large turnout of citizens who are desperate for better infrastructure. According to candidates, our first forum was the largest crowd they had witnessed, in any election year, for a council candidate forum. Lobbying for NACTO. Lobbied Asheville City’s Multi-Modal Transit Committee to vote in favor of recommending to City Council that Council adopt NACTO design guides. The committee voted in favor and their vote is an important precursor to City adoption of NACTO standards. Assisting with public events to showcase a better City. We supported active transportation initiatives such as Walkable Wall Street and Open Streets Asheville. Launched a new website, strengthening our message to city planning and transportation officials and making it easier for our community to stay in the loop with Asheville on Bikes. Promoted a video showcasing a local rider that was punched in the face by a motorist. The video received national attention, racked up more than 170,000 views, and triggered a wide open conversation about what constitutes acceptable behavior on our roads. Our best year of group rides, ever! We hosted bigger and better-than-ever community rides and events to welcome more people to urban bike riding. 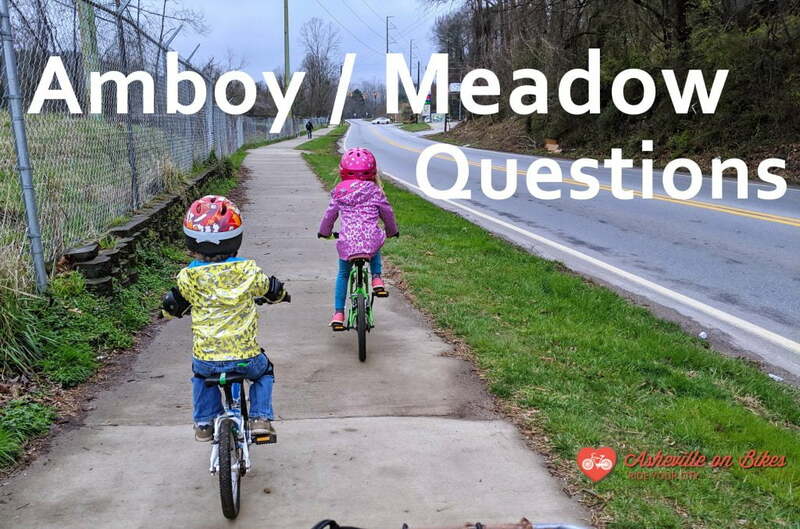 Developed a strategic plan to strengthen our voice, streamline our goals, and identify needed resources to improve bike-friendly infrastructure in Asheville. Success after lobbying for a better RADTIP. We continue to provide input and hold officials accountable regarding planned RADTIP improvements. After we brought public pressure to the issues surrounding cancellation of the Lyman street protected bike lanes, all city council candidates listed this particular protected bike lane as the top priority for what to build in the RADTIP. On October 25th, City staff succeeded in winning a grant from the Buncombe County TDA for $4.7m, to cover the additional cost of original Lyman St design, including protected bike lane and greenway! Introducing Tactical Urbanism to Asheville. AoB is co-sponsoring a lecture by Tony Garcia of Street Plans, a leader and innovator in tactical urbanism, and currently working with the City of Asheville and Blue Ridge Bicycle Club to host a series of tactical urbanism projects in the spring of 2018. Now picture this: without financial support from our members, none of this would have happened. But with your support, we can meet this donation challenge and make even greater progress in 2018 towards making Asheville a truly rideable city for all. What are you waiting for? Donate now, and you’ll feel great knowing you’ve done your part to see real change in Asheville’s transportation culture.